Our popular Craft Supplies Sale and Books in the Breezeway Sale is being held on September 9 and 10, Friday and Saturday, 9 a.m. to 2 p.m.
Quilters Linda Simms, Louise MacDonald and Sammie Simpson love their favorite hobby. MacDonald and Simpson will be at the 2011 Craft Supplies Sale to encourage and help other quilters find a new project. If you are an artist or craftsperson, or want to be, don’t miss Friends of Murphy Library’s popular Craft Supplies Sale and Books in the Breezeway Sale on Friday and Saturday from 9 a.m. to 2 p.m. This is the 5th year the Craft Supplies Sale has been raising money for prizes in the Cherokee County Schools annual Spelling Bee. The Bee is co-sponsored by The Cherokee Scout’s Newspaper in Education and Friends of Murphy Library. Crafters and artists sell their excess supplies and gift items and love to talk about their work. Terrie Allen will be there with her jewelry and Sammie Simpson with quilting items, along with Vivien Schell, Sharon Wilson, Jo-Ann Allen, Sharon Francis, and Margie King. 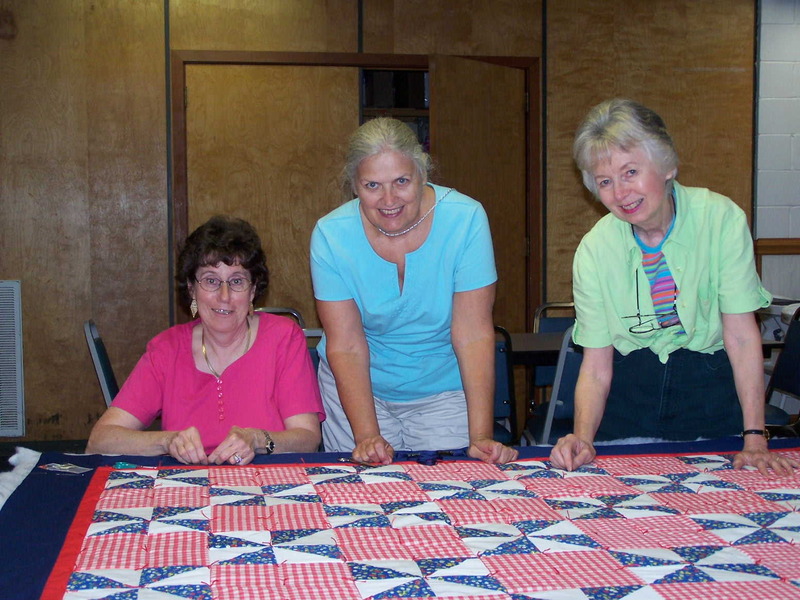 They will have tables full of quilting fabrics, yarn, scrapbook items – you name it, they can help you. We also have a pottery wheel for sale and lots of finished crafts. Are your bookshelves empty? The Murphy Library’s Books in the Breezeway bookshelves are loaded and waiting with great titles for fall reading for all ages. Call 837-2417.